British wrestler Miss Rachel has been menacing opponents since she first stepped into the ring at the tender age of 14. Her aggressive style and attitude--coupled with a very powerful physique--make her one of the most dangerous women on today's international indy scene. Miss Rachel has not only been destroying opponents in her native UK, but tours of Europe and North America have also put the grappling ladies of those continents in peril. And here's some bad news for the wrestling women in the Land Of The Rising Sun: a tour of Japan may be in her future! Miss Rachel is arguably one of the most powerful women on today's indy wrestling scene. Rachel tramples an unfortunate opponent. Outside of the ring: a pretty smile! Inside the ring: a vicious kick to the head of April Hunter! How It Started: I always loved watching wrestling on TV and I was really good at contact sports at school. When I came across an advertisement for the NWA-UK Hammerlock School of Wrestling one day, I decided I'd give it a shot. I was 14...the youngest in the class and also the only girl. It was a tough school, but that toughness has come in handy many times over the years! Gimmick: No nonsense, ready for anything fighter. Wrestling Style: I'm rough and tough, employing power moves and brawling. I can also be a wily veteran, pulling clever tricks out of the bag when I'm in a jam. Gear: No frills: long tights (in many different colours) and a tank top; occasionally an old school one piece; black kick pads. Titles Held: Coliseum Championship Wrestling Light-Heavyweight Champion (2002). Biggest Win: For the CCW Light-Heavyweight Championship. We wrestled for weeks and I got screwed-over every time, until the commissioner finally granted me a title match. We brawled for 30 minutes until I finally got a submission in the middle of the ring. Worst Loss: To Wesna in the Quarter Finals of the Chickfight 8 Tournament. I was on top and she hit me out of nowhere with a big kick to the head and knocked me out! Favorite Type of Match: Intergender is my favorite because there's no limit to how rough it can get and the victory is always harder fought. Saying that, I do also like to have straight singles matches against talented female opponents. Favorite Moves/Holds: Powerbomb; snap suplex; avalanche splash/bulldog combo; TKO; Boston crab; face buster; DDT; top rope splash; Northern Lights Suplex; Fisherman's Suplex. Finisher: Whatever gets the job done! Biggest Allies: Whoever comes in handy! Most-Hated Enemies: Anyone who thinks they're tough enough to beat me. 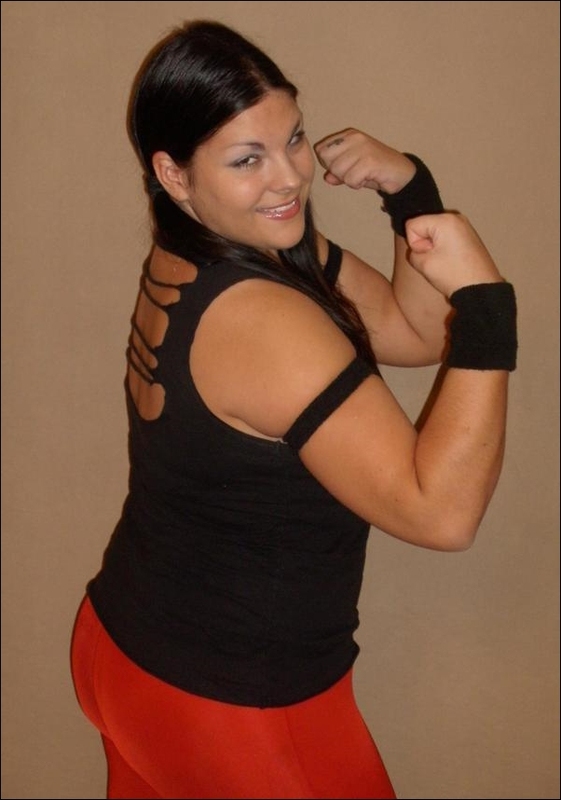 Toughest Opponent(s): Wesna; Amazing Kong; Candi Divine; April Hunter; Malia Hosaka; LT Falk. Career Highlight: Winning a men's title from a man. Favorite Wrestlers: Ken Shamrock; Jake Roberts; Sherri Martel; Candi Divine. Wrestling Ambition: To wrestle in Japan. That's the Holy Grail for a female wrestler and I'm no different in that opinion. I love MMA! Ken Shamrock is my hero.....I love reading and can get through a good sized book in three days.....I like to travel and feel so lucky that wrestling has afforded me that opportunity.....I'm also a tattoo addict! I have seven, three of which are BIG.....My favorite song is "Riders On The Storm" by the Doors and my favorite film is Ghostbusters (always brilliant).